Introducing your FY19 Core Board! The Core Board Executive Council election results are in, and nominations for appointed positions have been made! Below are the bios of this year's newly elected and appointed members. Kristen is a Mechanical Engineer who works at PepsiCo – Quaker Foods & Snacks in Milling Research & Development. She has worked at Quaker for the past five years since she graduated from The University of Iowa. Kristen has been active in SWE for nine years; four years as a Collegiate and five years as a Professional member. Throughout FY17 and FY18, Kristen was Jr. Girl Scout Day Chair. Prior to that, she was the SWE-ECI College Outreach Chair for three years. Aside from work and SWE, Kristen’s favorite hobbies are traveling and spending time outdoors with her husband, Devin, and their dog, Rylee. ​​For FY19, Kristen is now your acting President. She is ready to take on a new role and feels that this one will be a good fit for her to contribute more to the section. Katie is an Electrical Engineer who works at Rockwell Collins. She has been active in SWE since her college years at the University of Notre Dame. She joined SWE-ECI in 2011 and has previously served as K-12 Outreach Chair, during which she inaugurated the popular Girl Scout Day event, and president where she helped revamp the bylaws and bring in Rockwell Collins corporate sponsored memberships. She has been treasurer many times and earned the Leadership Award for SWE in 2015 and 2016. Katie has attended and organized numerous chapter events. Katie is happy to continue as treasurer as she feels that she is good at the role and has done a good job keeping SWE’s budget the last few years. She has ensured that our grant from Rockwell Collins is kept active, allowing many of the popular events to take place. Being treasurer allows her to help in many different aspects which she enjoys. It is also a good fit for her life, currently, as she has had to step back a bit with the birth of her son last November. The treasurer role allows her to support the chapter on her own schedule. Jill is a Project Manager for P&G Oral Care in Iowa City. She studied Mechanical Engineering at the University of Iowa, where she graduated in 2013. At the University of Iowa she was very involved with the Society of Women Engineers. She held several exec. board positions throughout her 4 years and rounded off with being the President her senior year. Upon graduation, Jill got involved with the local professional section, SWE-ECI. Over the last 5 years she has held several different positions on the Core Board. 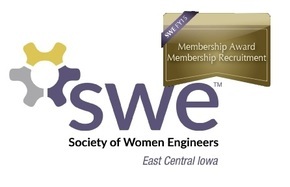 Jill is glad to continue being Secretary of SWE-ECI and to help out with membership. She enjoys being involved with every aspect of SWE - Professional Development, Outreach, Networking, Conferences, and Education. She is looking forward to what FY 19 has to offer! Nishi graduated from Embry-Riddle Aeronautical University, Daytona Beach, FL, in December 2017 with a Bachelors in Aerospace Engineering. She moved to Cedar Rapids to work as a Systems Engineer in the Unmanned Platform Systems team under Government Systems. She is currently supporting the development of ground control stations for UAVs and working to build next-gen technologies, which makes her very excited to go to work everyday! Nishi joined Rockwell Collins in the summer of 2016, as a Systems Engineering Intern and completed another rotation in the summer of 2017 at Air Transport Displays and Platform Systems, with the opportunity to work on Boeing 757/767 Retrofit aircraft avionics. While at ERAU, she was actively involved with the SWE chapter, attending conferences and partaking leadership roles. She was the lead organizer for many events, including Introduce a Girl to Engineering Day. Her interactions with mentors at the SWE conference have encouraged her throughout her professional career, and she hopes to facilitate that for other budding female engineers as well. By being the Communications/Marketing Secretary, she hopes to grow the social media presence of SWE-ECI; by managing our own handles on the social media platforms, she hopes to provide SWE with better visibility to the entire Eastern Iowa community of female engineers. She also sees this as an excellent opportunity to encourage participation from within Rockwell Collins and develop eternal sisterhoods. Katelyn is a Mechanical Engineer who works for DuPont Pioneer as a Plant Operations Specialist. In this role, she is responsible for efficient operations of a Corn and Soybean Seed Processing Plant and works closely with the maintenance department. She has been active in SWE since her Sophomore year of college at the University of Minnesota – Twin Cities. As a collegiate, Katelyn’s most notable position was as Team Tech. Director her Junior and Senior years. Since then, Katelyn was elected Treasurer of the Heart of Iowa SWE Section but due to moving has now joined the East Central Iowa Section. In her spare time, Katelyn can be found playing various sports including volleyball and softball. She also leads a Girl Scouts Troop, and founded a STEM Outreach Program at an elementary school close to where she works. Katelyn is excited to be the K-12 Outreach Chair because she's been heavily involved with SWE for several years. She will be moving to the Iowa City area within the next couple of months, which means she’s transferring to the ECI Professional Section. She's ready to jump right in by being involved in this leadership position. She has experience with both the Girl Scouts as a troop lead and Outreach activities through college volunteering experiences and through starting a new STEM outreach program in her local community. She believes that she will fit well and be able to add value in her position. She is continuously looking for ways to give back to the community and to encourage girls to break barriers. Ashley served the SWE-ECI core board as the K-12 Outreach chair in FY18. She grew up west of Cedar Rapids and graduated from The University of Iowa with a Biomedical Engineering degree. She's an Industrial Engineer at Rockwell Collins, currently in a rotation program that will take her out to Portland in December. Her husband and she have one spoiled baby - a really fluffy pyredoodle! As she will be leaving in the winter, she is excited to be the Jr Girl Scout Day chair and hold her event in October. This past year, she directed the execution of Introduce a Girl to Engineering Day at the Rockwell Collins in Manchester. She hosted 50 eighth-grade girls for the day, organized keynote speakers, and introduced the girls to STEM ideas/principles through hands on activities. Because of this, she thinks she is ready to take on the challenge of SWE-ECI's popular Jr. Girl Scout Day event! Kate works at Rockwell Collins and is excited to get further involved with SWE-ECI and outreach! Sravani works at Rockwell Collins. She served on the SWE-ECI nominating committee in FY18 and has attended numerous events with SWE-ECI over the past years. She is excited to get more involved as a committee chair this year.